Franklin-Monroe’s Kloe Zink (3) gets a smash over the net against visiting National Trail on Tuesday night in a Cross County Conference battle. The Jets topped the Blazers in three sets. 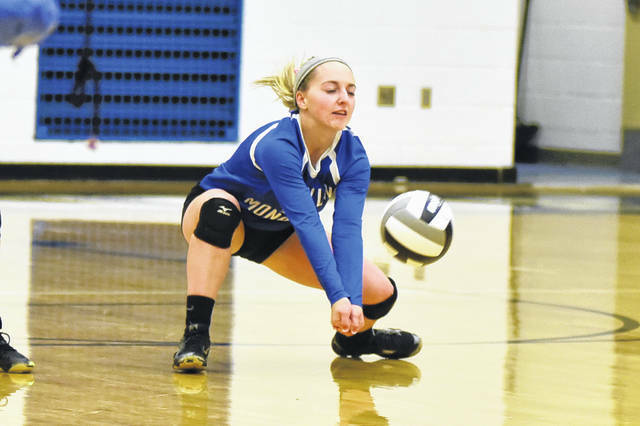 Franklin-Monroe’s Belle Cable (2) gets low on defense against visiting National Trail on Tuesday night in a Cross County Conference battle. The Jets topped the Blazers in three sets. 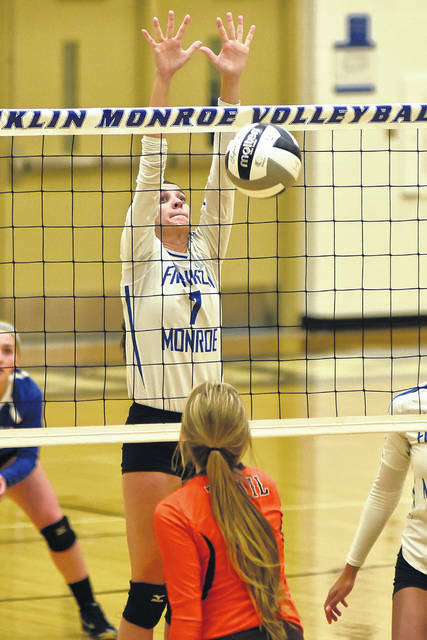 Franklin-Monroe’s Brigette Filbrun (7) goes up for a block against visiting National Trail on Tuesday night in a Cross County Conference battle. The Jets topped the Blazers in three sets. Franklin-Monroe’s Chloe McGlinch (13) gets a smash over the net against visiting National Trail on Tuesday night in a Cross County Conference battle. The Jets topped the Blazers in three sets. 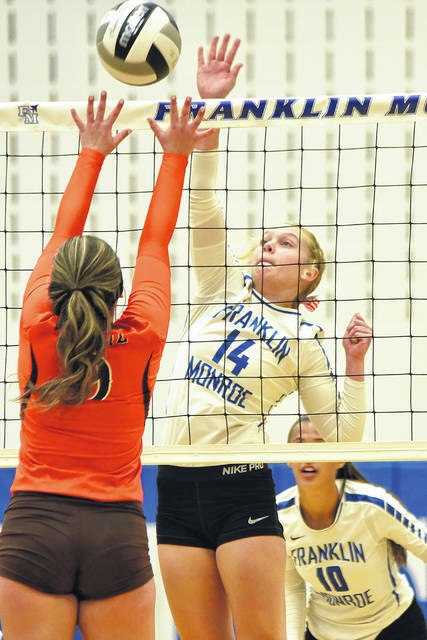 Franklin-Monroe’s Chloe Peters (14) gets a smash over the outstretched arms of a National Trail player on Tuesday night in a Cross County Conference battle. The Jets topped the Blazers in three sets. 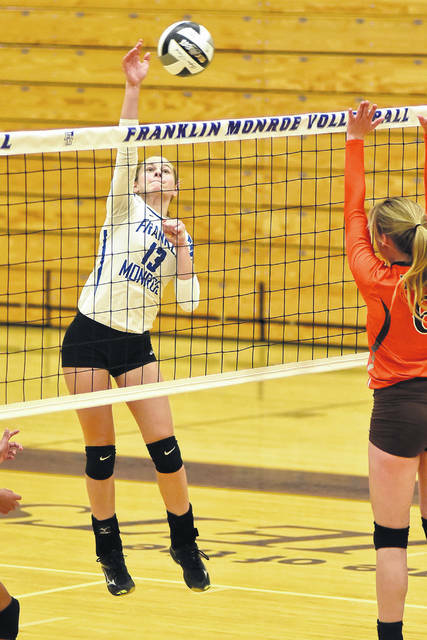 Franklin-Monroe’s Chloe Peters (14) sends a serve over the net against National Trail on Tuesday night in a Cross County Conference battle. The Jets topped the Blazers in three sets. Franklin-Monroe’s Corina Conley (10) goes up high for a block at the net against National Trail on Tuesday night in a Cross County Conference battle. The Jets topped the Blazers in three sets. Franklin-Monroe’s Kennedy Morris (8) sets the ball up for one of her teammates against National Trail on Tuesday night in a Cross County Conference battle. The Jets topped the Blazers in three sets. 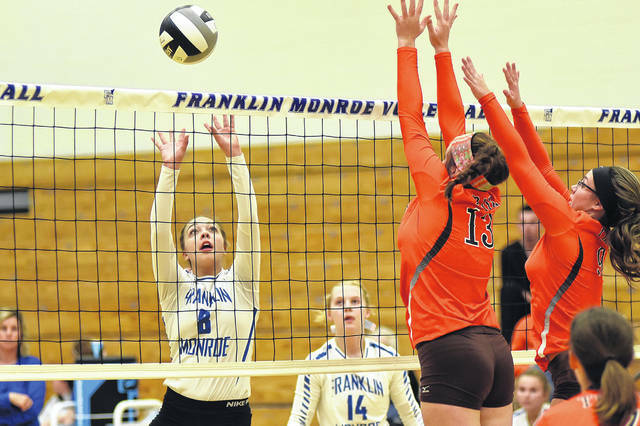 PITSBURG – Franklin-Monroe came out firing on all cylinders in its league match with National Trail on Tuesday night. The home team jumped all over the Blazers 25-6 in the first set, struggled a little in the second, but pulled ahead late to take it 25-21 and finished the final set in convincing fashion 25-12 for the match. 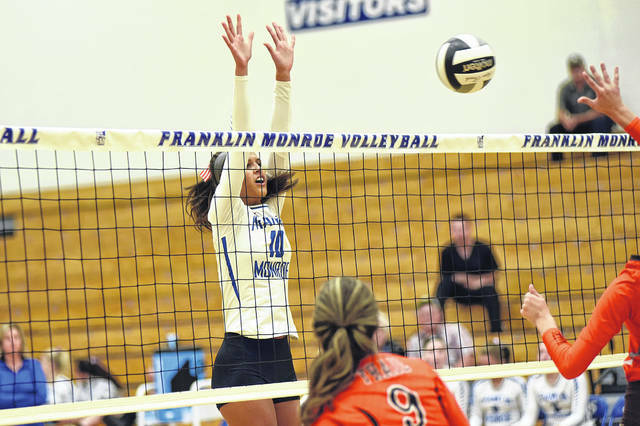 “We came out strong in that first set and we were on our game,” Franklin-Monroe volleyball coach Angie Filbrun said. The Jets got very little pushback from Trail, steam rolling to the 25-6 win. Sophomore Chloe McGlinch had the hot-hand serving with 6 points in the first set. Chloe Peters and Brigette Filbrun both served 5 points each as well. National Trail came out strong in the second set and built a lead up on the Jets 7-2 and then 11-6. Franklin-Monroe battled back and narrowed the lead down to 19-17. The Jets finally took the lead on a McGlinch kill to go up 21-20 and they would go on to win a hard-fought set 25-21. “In the second set we got down early and so midway through I called a timeout and said we have to figure this out, go finish,” Filbrun said. “I felt like they responded and turned it around after that to get the win. “We played Fort Recovery last night and although we didn’t win it was a great game to have on our schedule,” she continued. “Our girls played really hard and maybe we let down a little in that second set. It is good to have a tough game like that to help us get better. “In the third set we came out and played our game and took it to them and finished the game strong. That’s what we need to do to get ready for a big game we have Thursday with Miami East. We need to be at our best to get that one,” Filbrun concluded. Chloe McGlinch served 3 aces and 7 kills, Chloe Peters added 7 kills with 11 digs, Brigette Filbrun had 15 service points and 9 assists, Kennedy Morris contributed 5 assists and 5 digs, Belle Cable had 10 digs and Corina Conley led the way with 15 service points, 2 blocks and 15 kills. 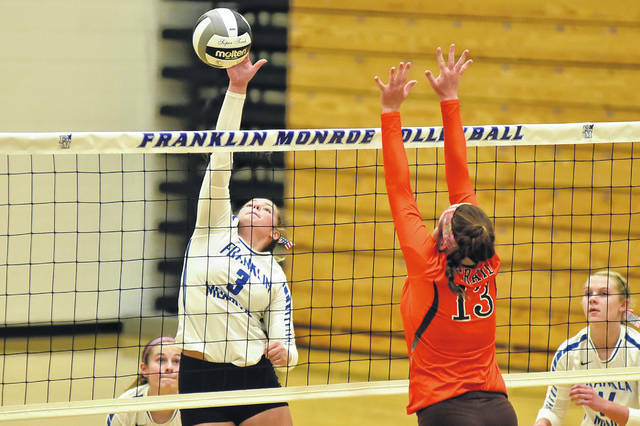 Franklin Monroe improved to 8-3 overall and 4-1 in the Cross County Conference. 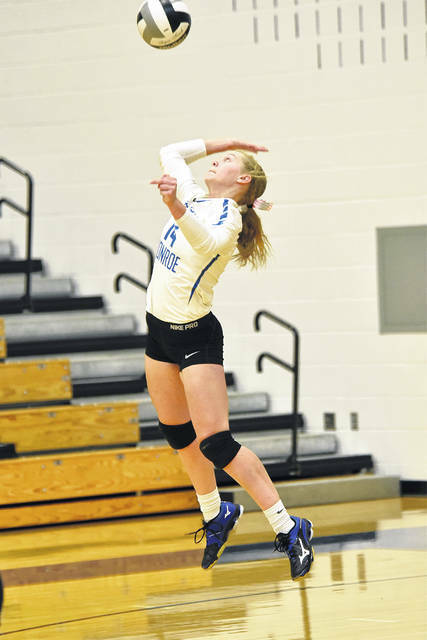 This entry was tagged CCC, Franklin-Monroe Jets, girls volleyball, National Trail Blazers. Bookmark the permalink.